EBENSBURG — In a defensive battle, Bishop Carroll used a early second quarter surge to create separation against Laurel Highlands Conference Section 1 foe Penn Cambria. The Huskies went on an 18-1 to begin the second in what equated to be the only lengthy spurt throughout Monday’s contest. Bishop Carroll was able to limit its furnovers, shoot just a tick better from the field and knock down foul shots in the fourth to pull away with a 50-38 victory on its home court. “You have to get a decent lead on them with the way they can shoot the basketball. I told (Penn Cambria coach) Scoot (Ronan) they’re going to win a bunch of games with the way they shoot that thing,” Bishop Carroll coach Cosie Aliquo. Penn Cambria began the night making three of its first four shots from behind the arc. However, the Panthers suffered through costly cold spells to finish with a 27 percent clip from the field. Sophomore Tristan McDannell led Bishop Carroll with 14 points off the bench. Senior sharpshooter Ben Eckenrode added 12 points on four treys. Senior Braedon O’Donnell buried four of his team’s eight 3-pointers on his way to a 14-point night. Threes from Richard Perrone, Jacob Shuagis and O’Donnell jumpstarted Penn Cambria with an early 9-3 lead. But the Huskies ended the quarter on a 7-2 run to pull within 11-10 after one. Junior Carson Ertter hit a jump shot right before the buzzer for BC. Facing Penn Cambria’s 2-3 zone, five different Huskies scored during a 18-1 burst to lead 26-12 with 3:10 left before halftime. Bishop Carroll started out the frame with a 4-for-6 mark while Penn Cambria missed its first 10 shots. Tanner Perrone ended a field goal drought that lasted 5:42. “We were stuck on that 12. We couldn’t find a way to score,” Ronan said. Penn Cambria freshman Jake Tsikalas banked in a triple to cap a 7-0 run as Bishop Carroll led 26-19 at intermission. After the first couple minutes of the game, Bishop Carroll began contesting Penn Cambria’s 3-point attempts better. Bishop Carroll finished the second quarter with a 16-8 scoring advantage. Both teams scored 11 points in the third, as both teams exchanged 6-0 mini runs. In the fourth, an O’Donnell trey brought the Panthers within four on the first possession. The senior later buried another triple to cut the deficit down to five with three minutes left. But Penn Cambria could not make another basket while six of their 19 turnovers came in the fourth to prevent any chance of a comeback. After Bishop Carroll missed two front ends of a one-and-one, Ertter and McDannell combined to make BC’s final eight foul shots. “Carson and Tristan started coming on at the end at the foul line. They’re going to have the ball at the end of the game so they got to make them,” Aliquo said. Ertter and Alex Karlheim added eight points for BC. PENN CAMBRIA (38): O’Donnell 5 0-0 14, Shuagis 1 0-0 3, T. Perrone 2 0-2 4, Ronan 1 3-6 5, R. Perrone 2 1-2 7, Tsikalas 2 0-0 5, Smith 0 0-0 0, Weigand 0 0-0 0, Reese 0 0-0 0. Totals–13 4-10 38. BISHOP CARROLL (50): Karlheim 4 0-1 8, Ertter 1 6-6 8, H. Rodkey 2 1-2 6, Ratchford 0 0-0 0, Eckenrode 4 0-0 12, McDannell 3 8-9 14, Burk 1 0-1 2, Semelsberger 0 0-0 0. Totals–15 15-19 50. 3-point field goals: Penn Cambria 8 (O’Donnell 4, R. Perrone 2, Shuagis, Tsikalas); Bishop Carroll 5 (Eckenrode 4, H. Rodkey). 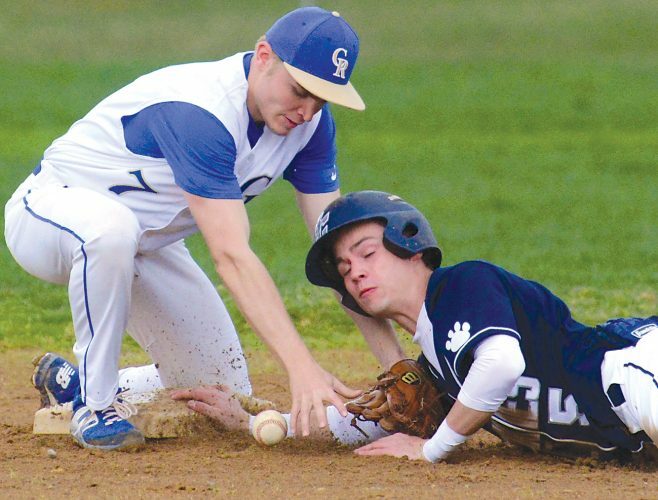 Records: Penn Cambria (5-8; 1-4 LHAC Section 1); Bishop Carroll (10-3; 3-1 LHAC Section 1). Officials: Cliff Kitner, Jason Moschgat, Chad Walsh. JV: Bishop Carroll, 50-39. High scorers–Kochara, PC, 9; Semelsberger, PC, 15.